Coronary artery embolism is an established cause of acute coronary syndrome, but paradoxical coronary artery embolism causing myocardial infarction is rare and requires a high degree of clinical suspicion for diagnosis. Recognition of this condition is important as these patients are at risk of future fatal embolic phenomena. A search for venous thrombosis and underlying prothrombotic conditions should be undertaken. 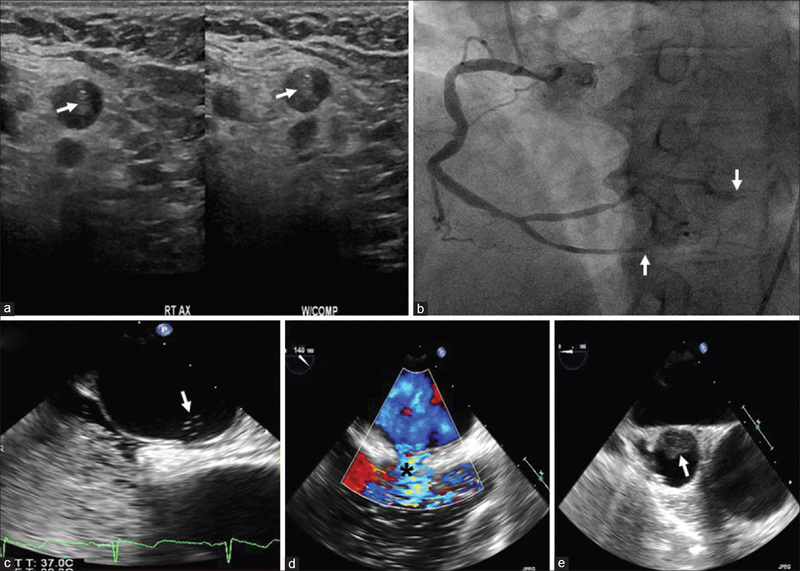 Percutaneous device closure of interatrial communication either in the form of patent foramen ovale (PFO) or atrial septal defect (ASD) should be considered to prevent future embolism. A 64-year-old male with multiple myeloma was admitted for autologous stem cell transplantation. Two weeks previous he was diagnosed with a peripherally inserted central catheter (PICC)-related right basilic and axillary vein thrombosis [[Figure 1]a, arrows] complicated by pulmonary embolism that was treated with low molecular weight heparin. During an attempt at PICC removal, the patient coughed and developed sudden severe left-sided chest pain. An electrocardiogram showed ST segment elevation in inferior (II, III, and aVF) leads. Cardiac biomarkers were elevated (Troponin-T 2.230 ng/ml (normal <0.01 ng/ml) and creatine kinase myocardial band fraction 65.1 ng/ml (normal <6.7 ng/ml)). Coronary angiography revealed flush occlusion of the posterior descending artery and posterolateral branch of the right coronary artery [[Figure 1]b, arrows]. Severe thrombocytopenia (platelet count 37 × 109/L) secondary to newly diagnosed heparin-induced thrombocytopenia precluded use of antiplatelet agents and hence, coronary intervention. Bivalirudin was initiated for anticoagulation.Chest pain and echocardiographic changes resolved. Transesophageal echocardiography with agitated saline showed a small PFO ([Figure 1]c, arrow) with bidirectional shunt seen on color Doppler imaging [[Figure 1]d, asterix]. In addition, a large thrombus was seen in the superior vena cava [[Figure 1]e, arrow]. A diagnosis of ST elevation myocardial infarction secondary to paradoxical embolism to the right coronary artery was entertained. In addition to long-term treatment with fondaparinux for venous thrombosis, percutaneous PFO closure was recommended to prevent recurrent embolism. Paradoxical coronary embolism is rare and accounts for 10-15%. of all paradoxical emboli, and 25% of acute coronary events in patients less than 35 years of age. Our patient had a documented PICC associated thrombus, and an episode of cough preceding the onset of chest pain caused transient elevation in right atrial pressure with right to left shunting and paradoxical embolism though a PFO. The Valsalva maneuver is routinely used to demonstrate shunting across the PFO during echocardiographic examination in individuals in whom spontaneous shunting is not seen. Paradoxical embolism was first reported by Cohnheim in 1877  and is known to cause cerebral, peripheral arterial, and in rare instances coronary artery occlusion. Paradoxical coronary artery embolism should be suspected in patients who otherwise are at low risk for atherosclerotic coronary artery disease. In a given clinical scenario, demonstration of venoarterial communication (most often at the atrial level) together with identification of a venous source of embolus and lack of thrombi in the left heart fulfill the criteria for presumptive diagnosis of this condition. A definite diagnosis requires demonstration of thrombus across the venoarterial communication either by echocardiography or contrast computed tomographic angiography of the chest. Many times paradoxical coronary artery embolism can only be made at the time of autopsy. When suspected clinically, a search for an underlying condition predisposing to venous thrombosis should be undertaken. The management of acute coronary syndrome caused by paradoxical coronary artery embolism is similar to that occurring in the setting of atherosclerotic coronary artery disease. Manual aspiration thrombectomy with or without angioplasty and stenting followed by aggressive medical management including antiplatelet agents, is the standard of practice. Anticoagulation therapy should be started for established venous thrombosis. The management of patients with contraindication to antiplatelet therapy may be challenging as in this case. Aspiration and manual thrombectomy should be the main therapeutic intervention in such a situation unless the embolus is distal in a small coronary artery. Measures to prevent recurrence should be considered. Optimum therapeutic strategy in preventing recurrent embolic events in patients with PFO is not established. A recent meta-analysis of three randomized clinical trials addressing the role of transcutaneous closure of PFO showed a benefit in preventing recurrent cerebrovascular ischemic events in patients with cryptogenic stroke when compared with medical therapy. Another study demonstrated lower recurrent neurological event rates with Amplatzer compared with CardioSeal-STARflex and Helex devices. Although percutaneous device closure has not been studied in paradoxical coronary embolism, it should be considered to prevent fatal recurrent events. In summary, paradoxical coronary embolism is a rare cause of acute coronary syndrome. Once suspected, careful transesophageal echocardiographic examination is important for presumptive diagnosis. In addition to acute management of acute coronary syndrome, PFO closure to prevent recurrent thromboembolism should be considered. Wachsman DE, Jacobs AK. Paradoxical coronary embolism: A rare cause of acute myocardial infarction. Rev Cardiovasc Med 2003;4:107-11. Velebit V, al-Tawil D. Myocardial infarct in a young man with angiographically normal coronary arteries and atrial septal defect. Med Arh 1999;53:33-6. Cohnheim J. Thrombose und Embolie. In: Vorlesungen Über Allgemeine Pathologie. Berlin: Hirschwald; 1877. p. 134. Johnson BI. Paradoxical embolism. J Clin Pathol 1951;4:316-32. Wilson AM, Ardehali R, Brinton RJ, Yeung AC, Vagelos R. Successful removal of a paradoxical coronary embolus using an aspiration catheter. Nat Clin Pract Cardiovasc Med 2006;3:633-6. Hornung M, Bertog SC, Franke J, Id D, Taaffe M, Wunderlich N, et al. Long-term results of a randomized trial comparing three different devices for percutaneous closure of a patent foramen ovale. Eur Heart J 2013;34:3362-9.